Part 1 Understanding friction in textiles: Textile fiber morphology, structure and properties in relation to friction; Fundamental concepts of friction and lubrication affecting textile fibers; Friction behaviour of fibrous materials used in textiles; Stick-slip phenomena in textiles; Experimental methods for analyzing friction in textiles. Part 2 Friction in particular textile fibers and processes: Friction and surface characteristics of cotton fibers; Friction, felting and shrink-proofing of wool; Friction and surface characteristics of synthetic fibers; The role of fiber friction in staple fiber processing; Friction in woven fabrics; Finishes and treatments to control friction in textile fibers; Boundary lubrication phenomena in coated textile surfaces. Friction is a major issue in both the production of textiles and in the finished product. This authoritative book reviews how friction occurs and the ways it can be measured and controlled. The book begins by looking at how friction can be defined and how the structure and properties of textile fibres lead to friction behaviour. It also discusses slip-stick phenomena in textiles and ways of measuring friction in yarns and fabric. The second part of the book reviews friction in particular textiles, including cotton, wool and synthetic fibres as well as woven fabrics. These and other chapters also discuss ways of controlling friction, including fabric finishes and lubricants. 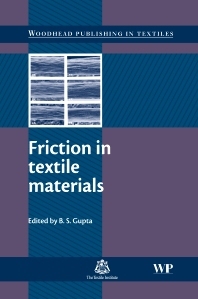 With its distinguished editor and contributions from some of the world’s leading authorities in the subject, Friction in textile materials is a standard reference for the textile industry and those researching this important topic. Dr Bhupender S. Gupta is Professor of Textile Engineering, Chemistry and Science at North Carolina State University, USA. Professor Gupta is internationally renowned for his research in textile science.